Note: If you are looking for a Microsoft Surface Docking station instead of these extra gadgets, check out this review. from Microsoft. Although it is slightly thicker than the sleaker touch keyboard, the tactile feedback and rigid support it provides makes it the better choice if you will be doing any serious typing. Initially, I thought I would prefer the coolness of the touch keyboard. The fact that I can’t feel the keys as I type and can only type on a hard surface made me quickly regret getting the touch keyboard. While Microsoft gives away a keyboard with the Surface RT, you’ll have to buy one with the Surface Pro. In my opinion, it is the most useful gadget. The thing that I love about this hub is how slender it is and how easily this can be mounted out of sight when hiding cables. 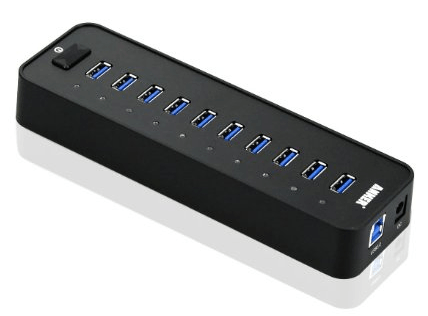 With the speed that USB 3 provides, you can easily run several USB attached devices including external monitors. 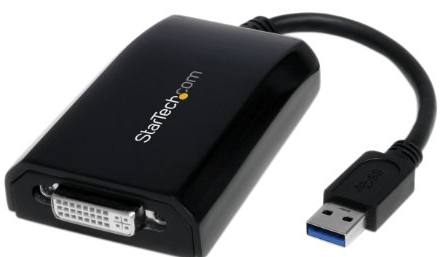 to connect a single monitor, why not take advantage of the USB 3 speed provided by a hub. As a bonus, you only need to connect a single USB cable (the hub) to attach multiple monitors! Microsoft makes a USB NIC adapter for the Surface Pro. At $40, it doesn’t seem like too terrible of a deal. That is until you find out that it is only USB 2 and is only 10/100. 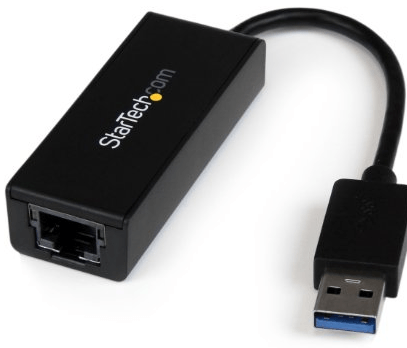 A better deal can be found with this USB 3.0 to Gigabit Ethernet NIC Adapter. To me, the three coolest features of this adapter are: the driverless install, Wake On LAN support, and the stability it provides. When coupled with the gadgets above, your Microsoft Surface can seamlessly act like a desktop by attaching just one USB cable. for your Surface means never misplacing or forgetting your primary adapter at your desk or on a trip. Because Microsoft now confirms that the 24W Surface RT power supply will work on the Surface Pro, you can save some money by using it as your spare power supply. Although charging will be a little slower, the smaller power adapter is worth the trade off. Because the adapter only has one cable instead of two cables, the power supply is a lot cleaner in appearance and easier to pack. There you have it! Those five gadgets can turn your Surface Pro from a great tablet into the only device you need – at work or on the road! The only thing left is to setup Hyper-V and carry your test lab with you anywhere you go! My question for you is – did I miss anything? Do you think you need some more storage? A memory card adapter? If you know of a good extra gadget, let me know in the comments below. The Amazon links above are affiliate links that refer to DeployHappiness. Hello Joseph and thanks for your post. I have a question: I bought a Matrox DualHead2Go adapter to connect my Surface with 2 external monitors. The problem is that although they are connected, these 2 monitors act as one. In the display properties I see three monitors: Surface’s and the 2 external. I do not know how to make it work. The USB adapter that you are using can extend the monitors or not? To make it more clear, although I have extend the image to these two monitors, the icons remain on the Surface’s monitor and the other two monitors act as one. I just want to have everything in the two external monitors and not in the Surface’s screen. In other words, I need to have the option “when I close the lid move everything in the external monitors”. But there’s not a lid on a Surface, so how can I make it work? 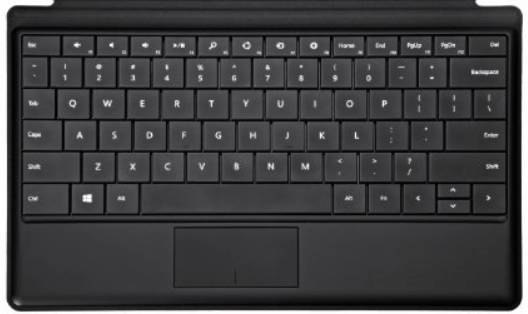 Hi Chris – First, I have a type keyboard on my surface that acts like a lid. In display properties. I have the Surface display (display 1) set to disconnect this display. My 2nd, 3rd, and 4th displays are set to extend desktop to this display. Does that help? Well, maybe I am doing something wrong, but I do not see the “disconnect this monitor”. But even if I disable Surface’s monitor, still I see the other two monitors as one in the Display Properties. I have used also a HP 3005pr port replicator and again I see the two external monitors as one. I don’t know if you understand what I mean… When I go to Display properties, under the “change the appearance of your displays” I see two displays, number 1 and number 2. Display number 2 is actually the two external monitors and display number 1 is the Surface display. S every time I maximize a window in one of the external monitors, then the window covers both the external monitors and this is not what I want. It almost sounds like you have a video splitter. What are you using to duplicate the displays? Well, a supplier sold me an HP 3005pr docking station insisting that this works perfect with the Surface. I bought it 145 euros and it is useless as I cannot see anything while I am working through my Citrix environment. I decided to buy the Star Tech external adapter which arrived within 3 days and it works perfect! I am going to buy 4 more of these for the rest of my Surface users. Thank you very much!!! Thank you so much for posting this! I got my pro months ago and all I kept finding for suggested accessories were the typical ones that didn’t expand the functionality of it so I quit looking for awhile. I will definitely be sharing #3 at work. Even our IT didn’t suggest that to my boss when he wanted to hook up an extra screen to his laptop – which is not supported by our cheap onboard video cards. It is amazing how much can run through USB now!! Because the Surface has a USB 3 port, you will never bottleneck as well.